The Workspace ONE UEM Samsung E-FOTA Tool is designed to add to the existing abilities of AirWatch's Samsung E-FOTA implementation. These new abilities include scheduling a firmware/OS update in a targeted window. This feature is dependent on the existing abilities within AirWatch which enroll the MDM into Samsung E-FOTA and push profiles to enroll the device into Samsung E-FOTA. 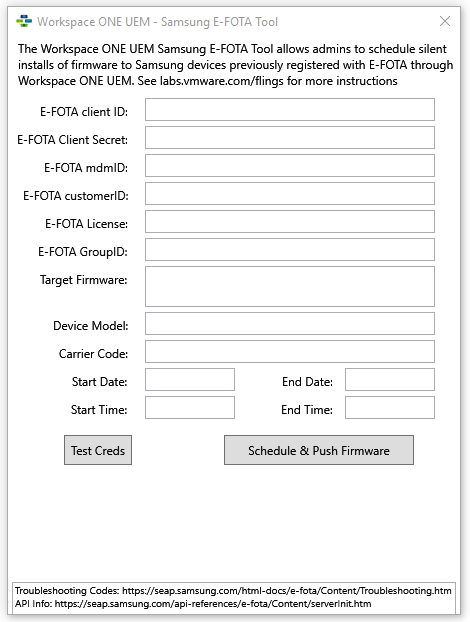 Users should use this tool along with the information gathered from the Workspace ONE UEM console. The information can then be used to make an API command to schedule the firmware/OS update to your Samsung devices. Summary Requirements Instructions Changelog Comments Bugs Please see .PDF in Downloads.